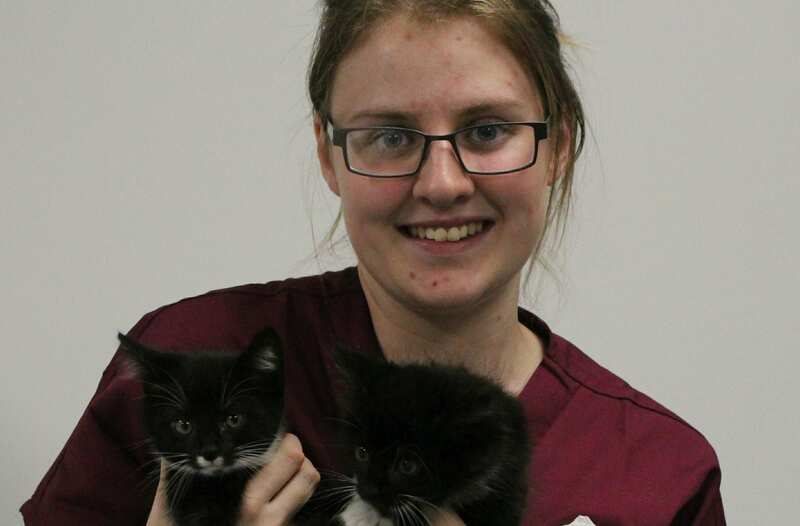 An animal lover is celebrating success after becoming Nelson and Colne College’s first vocational alumna to qualify as a vet. Emily Long, from Burnley, has landed herself a job at Hird and Partners Veterinary Surgery, in Halifax, after graduating as a veterinary surgeon from The University of Nottingham. The 25-year-old studied a BTEC national diploma in Science at NCC between 2006 and 2008, and has now shared how the support and opportunities she was given at College ultimately helped her achieve her dream career. Emily, who completed a preliminary veterinary programme at University before beginning a five year veterinary medicine and surgery course, said: “Ever since I can remember I have always dreamt of a career in which I could combine my love of science with my love of animals. “Rachel Meredith, from NCC’s Student Services, recognised my determination at College and went the extra mile to help me achieve my goal. “The teaching quality on the national diploma was fantastic and the staff inspired me to pursue Science within my career. There are only seven vet schools in the UK, with each only accepting the country’s top students – making Emily’s journey even more remarkable, and recognising that vocational qualifications can be as highly regarded as traditional academic routes. NCC’s Curriculum leader for Science Kirsten Graham said: “We are always thrilled to hear of the success of former students, and we congratulate Emily on becoming the College’s first vocational student to qualify as a vet. The UK science industry employs more than 900,000 people, and by studying a BTEC national diploma in Science, students have the opportunity to progress to a number of exciting and varied roles. These include becoming a biomedical scientist, a marine biologist or a criminologist. NCC’s success stories include Callum Martin, who began studying Forensic Archaeology at Exeter University, after achieving a triple distinction star. For more information on Science at Nelson and Colne College contact 01282 440272.